The spirit of innovation is not only flying high across Northwest Indiana, it’s now piloted by a new flight crew with broader horizons. In June 2018, the vaunted Society of Innovators of NWI entered a collaboration agreement to establish itself as the Society of Innovators at Purdue University Northwest. This super-charged alliance will jettison the organization on a new flight path, expanding its impact on the Region’s economy, community development and tightly focused initiatives. “The Society of Innovators will now build on its success, propelled by the enthusiasm of its 1,600 members and the commitment of its new board of directors,” said Gary Johnson, the board’s new chairman. “The society is deeply involved in the implementation process of this strategy, and it will take ownership of several initiatives outlined in the report,” said Johnson, president of Mortar Net Solutions in Burns Harbor. Johnson was one of three board members who were instrumental in keeping the society moving forward when Ivy Tech Community College chose to end its affiliation after 13 years. The other two board members involved in the transition are Don Babcock of NIPSCO and Maggi Spartz of Unity Foundation of La Porte County. Falzone, who’s also on the society’s board, said the organization will look for new opportunities to collaborate with other groups in the private, public and not-for-profit sectors to increase its role as a driver of innovation. For example, it might work jointly with PNW to develop workshops or certificate programs. Many of the innovators who’ve been formally recognized by the society over the years enthusiastically welcome the news. 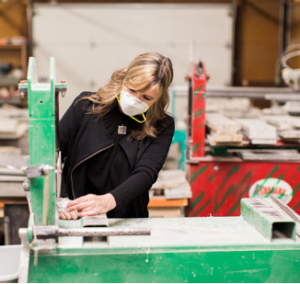 Rizzo saw an undiscovered treasure trove in discarded granite, and she now is recognized internationally as a global recycler of rocks that dinosaurs once walked on. She credits the society, as well as its former Ivy Tech mentors, O’Merrial Butchee and John Davies, for recognizing strengths in her that she never would have discovered on her own: Most notably, listing her innovations in the Congressional Record. “This gave me major credentials that I never would have been able to achieve on my own,” said Rizzo, who has since appeared on 14 TV shows to showcase her work. Norm Fischer, founder and chief engineer of The Fischer Group in Crown Point, credits the society’s recognition as an “incredible high point” in his long career. “It definitely brought local attention to our company through social media from many who knew us but didn’t really know what we did,” said Fischer, who has moved to Arizona with his wife and business partner, Julie, to expand the company’s reach into the Southwest. For 38 years, Fischer toiled as a problem solver in his industry, culminating with the patented invention of an energy-efficient compressed air desiccant dryer. Think of it as a high-tech new way to remove humidity and contaminants from the air, a necessity for industrial manufacturing. His firm designed, built and installed three large dryers for ArcelorMittal, with energy savings in excess of 7 million kilowatts annually, the equivalent savings of $500,000. 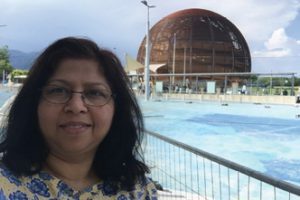 “The discovery in 2012 remains a crowning achievement in the history of particle physics,” said Parashar, a professor of physics at PNW whose work helped land the 2013 Nobel Prize for United Kingdom’s Peter Higgs and Belgium’s Francois Englert. In 2014, she was recognized by the society for her crucial role in the historic discovery. The award also created awareness of the physics program at PNW, including the opportunities to conduct discovery-driven scientific research. In 2015, her research work was federally funded with $407,000. “Because of my research work, PNW is on the global map of scientific discoveries,” she said. Robert Colangelo, founding farmer and president of Green Sense Farms in Portage, has noticed the society is growing in both reputation and stature. He was honored for his vertical farming innovations in 2014. Colangelo has converted his firm’s original farm into a large-scale production center for research and development. He also has teamed with key agricultural universities to provide full-scale research on a contract basis. And he has continued to raise capital to fund his U.S. farm network and to license technology for operating partners in foreign countries. “Being an innovator means that you must be fast to fail and quick to pivot,” he said. Many other innovator inductees also have pivoted to newfound successes after being blessed by the society. Scott Albanese recently completed a $33 million investment in one of the world’s foremost gummy-candy factories, equipped with robots and other technology. And Stewart McMillan from Task Force Tips is on the heels of a successful global business regarding firefighting equipment after launching a groundbreaking training academy for firefighters, first responders and police in Valparaiso. When the Northwest Indiana Regional Development Authority was honored by the society with its Accelerating Greatness Award in 2014, the first-of-its-kind organization was just making its case to the Indiana General Assembly to continue its efforts beyond the first 10 years. Since that time, the RDA has worked with local, state and federal authorities to secure funding for commuter rail expansion, and to establish new ways to connect that rail system to private investment through Transit Development Districts. On a personal level, Hanna is grateful when the hard work of his staff and its board is recognized. The reinvented Society of Innovators has similar ambitions to champion Hoosier innovation and to participate in strengthening its cultural presence in this Region. On Oct. 25, the society hosted a celebration of its new incarnation at the Venue at the Horseshoe Casino in Hammond. The organization’s plans include new initiatives focused on mentorship and networking through events and social media for innovators and entrepreneurs. As well as educational programs and workshops with “how to’s” to stimulate and lead innovation. And yes, of course, the society will continue to formally identify and publicly celebrate innovators and their unique achievements, following the impassioned lead of John Davies, the group’s initial navigator. Davies, who served as coordinator for the Oct. 25 celebration, is serving the society on a project-to-project basis. He hopes to remain involved with it at any level, and has nothing but superlatives for its new high-flying navigators. “Purdue is a terrific host because it lives and breathes innovation,” said Davies, who is launching his own innovation coaching business through Woodlands C&I Consultancy. 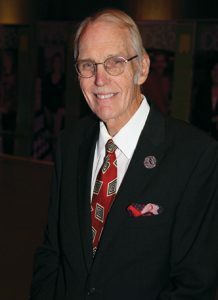 Through his years with the society, Davies devised 10 principles of “thinking differently” as an innovator—the common denominator with all inductees, he learned. “These innovators could be a future Thomas Edison, Henry Ford or Orville Wright,” he added, hinting at the society’s adventurous new flight plans. As its new stewards proudly boast to passengers and observers alike, if you thought the Society of Innovators was history, think again. It’s new mission is to make history. 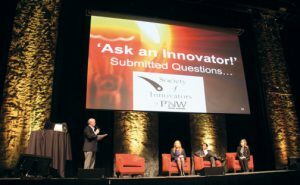 To learn more about the new Society of Innovators, visit www.nwisoi.org.